Located just 800 metres from Saint-Agrève centre, Le Bois Sauvage features accommodation sitting in an 1-hectare park with pétanque facilities, games room and free Wi-Fi. There is free private parking on site. The rooms come with park or mountain views, a flat-screen TV and a private bathroom with bathtub or shower. Some rooms also have a private terrace. Guests can enjoy a breakfast buffet served every morning. The local restaurant serves local regional products from the Auvergne and Ardèche. A supermarket, bar and restaurant can be found 1 km away. Guests can go golfing 8 km away. Lake Devesset is 10 km away. The closest train Station is in Le Puy en Velay, 50 km away. The restaurant is closed on Sunday from November to May. 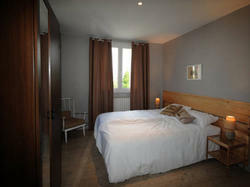 This quadruple room consists in 2 interconnected bedrooms. Each has a flat-screen TV and a safety deposit box. This room features a flat-screen TV and a a private bathroom with a bath or shower. Some rooms are located on the ground floor overlooking the park with a private terrace. This larger room features a flat-screen TV and a a private bathroom with bathtub. It offers park or mountain views. This room features a flat-screen TV and shower room. It offers park or mountain views.